The other day whilst walking back from the preserving garden I suddenly caught a whiff of lavender on the breeze. Looking to the house alongside me, I could see through to a garden where there were two long hummocks of the stuff, running the whole width of the lawn, all in full spikey bloom and an intense shade of purple. The bees were having a field day. It was well worth stopping to breathe in another purposeful whiff before going on my way. Lavender is in flower so fleetingly, and it reminded me to harvesting some to dry for the linen drawer as well as some for culinary use. As a little goes a long way, plants in the garden at home, though nowhere as lush as those I had passed, would yield quite enough for drying without leaving them noticeably shorn. It isn’t a crop that requires much in the way of pest control so is easy to grow organically. All the better for flavouring ice cream, buttery biscuits and cupcake icing. But a lightness of touch is most definitely required, as you can easily have too much of a good thing and end up with an overpowering medicated result. The flavour needs to be just there but hardly discernable, so getting the balance precise can be tricky. True lavenders, such as Lavandula augustifolia, including the popular Hidcote and Munstead varieties, are best for this, whereas the lavender hybrids called lavandins, bred especially for their oil are best avoided, as they are more likely to leave a strong camphorous aftertaste if used to flavour food. Ideally picked on a dry sunny day when the flowers are just on the cusp of bursting open, you only need to tie a bunch together with string and hang it upside down, somewhere dry and shaded for the flowers to dry out in no time. When completely dried through, just crumble the brittle flowers away from the stems and store them in a sealed jar alongside your other herbs and spices. You could then use some to make my lemon, fig and lavender marmalade, which is featured in my friend, Canadian writer and canner, Sarah B Hood’s new book We Sure Can available in the UK from September. I’ve also just made some Blaisdon plum and lavender jam, which has been a big success, so i will post that recipe next to encourage you on your fragranced journey. 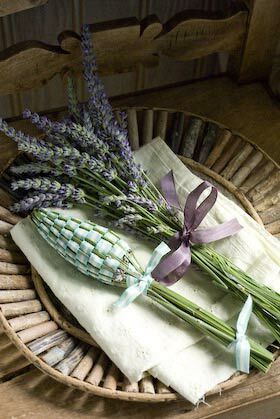 I thought I’d show you another traditional way to store a bundle of lavender, for scenting linens, where the flowers are encased in a cage made from the flower stems woven with ribbon. Called a lavender bottle, made this way, the flowers stay put and don’t go all over the place, so it can be pushed in between layers of stored bedlinen, kept in a drawer with your smalls or hung in the wardrobe to keep your best clothes sweet. For this the lavender variety is immaterial, the smellier the better. 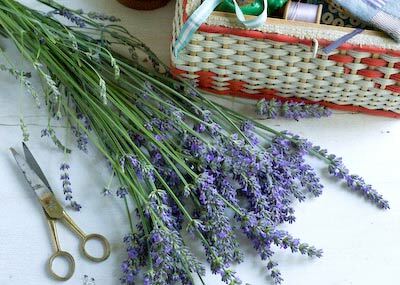 Again pick your lavender on a dry sunny day when the flowers are just about to be or are partly open. The stems need to be long, green and pliable. Pick an odd number of stems, I used 21 here, and bundle them together, so all the flowers are bunched up together and the stems are smooth, pulling off any smaller flowers lower down. Tie tightly together below the flower heads with a piece of thin ribbon or twine. Then one by one, bend the stems back over the flowers so they form a cage around them. You do have to try and arrange the stems as evenly spaced as possible to keep things as neat as you can at this stage. Tie a piece of ribbon or twine tightly around the stems to hold everything in place. Now, take a long length of narrow ribbon, 5-10mm (1/4-1/2in) wide is ideal, and starting at the top pointy end, wrap one end of the ribbon around one of the stems and fix it in place with a few stitches made with needle and thread. Begin to weave the ribbon in and out of the stems (you may find a bodkin useful to help with this), working round the stem cage and pulling the ribbon evenly to give the lavender bottle a good shape. When the flowers are completely encased by the woven ribbon, tuck the end of the ribbon around a stem and fix in place with a few stitches with needle and thread. Trim the stems to the length you like then tie the stems tightly together with ribbon at both ends. Leave the bottle to dry out for a while and give the flowers a squeeze from time to time to reactive the scent. Another fab way to scent bedlinen and clothing is to spray them lightly with lavender linen water whilst ironing or just before you put them freshly laundered into the linen or airing cupboard. 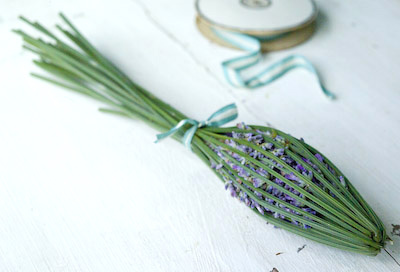 I love making lavender bottles or wands as they are sometimes called in the US. Your post made me wish my lavender was ready to harvest. That is the keenest idea for using lavender in your clothes drawers….mine didn’t come back this year. I want to make a trip to a farm in my state which only grows lavender though….wonder if they sell it fresh by the bunch….yumm. I had lavender shortbread for the 1st time earlier this year- loved it. Love your lavender bottle! That lavender bottle is so beautiful! I wish I had seen this before my lavender dried up. Next year! I’ve never seen a lavender bottle. They are even beautiful before the ribbon is woven in. Thank you for sharing how to make these. Wow such a pretty idea! I have never seen these before and shall making them this weekend for friends. My mother in law in particular loves lavender so this should keep me in the good books for a little while! Ps- I love your blog, thanks for writing. Just wish I lived in a similar climate to you! i am off to read more.. Thank you for reviving this memory.. my mother used to make these for me years ago and I have long wanted to try my hand at these lavender delights. How pretty! I love lavender. I should plant some in my garden. A friend from France made me a wand like this and I SO wanted to know how to do this! Thank you very much!! !